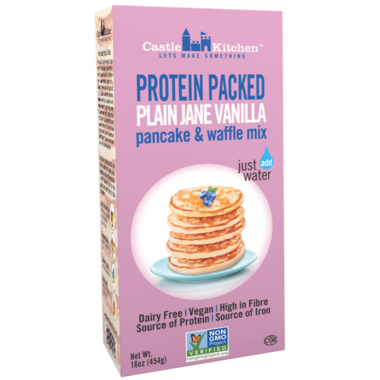 Protein Packed Plain Jane Vanilla Pancake & Waffle Mix is Dairy Free, Vegan, high in Fibre and a great source of Protein & Iron. 3/4 cup Water. REHEAT Skillet or griddle to low-medium heat (350 F/190 C). COMBINE In a bowl add the mix and water; whisk until large lumps disappear. Do not over mix. Let rest for 2 minutes for batter to thicken. POUR ¼ cup (50 mL) of batter for each Pancake onto lightly greased skillet or griddle. COOK Until bottom is golden, bubbles start to burst on surface, and edges dry out slightly. FLIP And continue cooking until second side is golden brown (About 2 more minute). Turn only once. 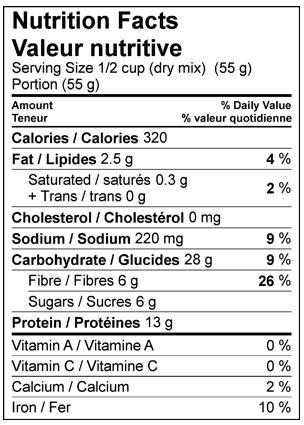 Ingredients: Whole Wheat Flour, Lupin Pulse Flour, Pea Protein Isolate, Cane Sugar, Baking Powder, Natural Flavour, Salt. This product contains Lupin; it may not be suitable for those with a Peanut Allergy. Wheat- Produced in a facility where Dairy, Eggs and Soy are present. It had the texture sand castles. Threw it all out. I did not enjoy this pancake mix. I followed the instructions and the pancakes always turn out crumbly and tough, and have an off putting taste. Thank you Castle Kitchen for an amazing product. I have tried several protein pancake mixes and this one by far is the best!! !